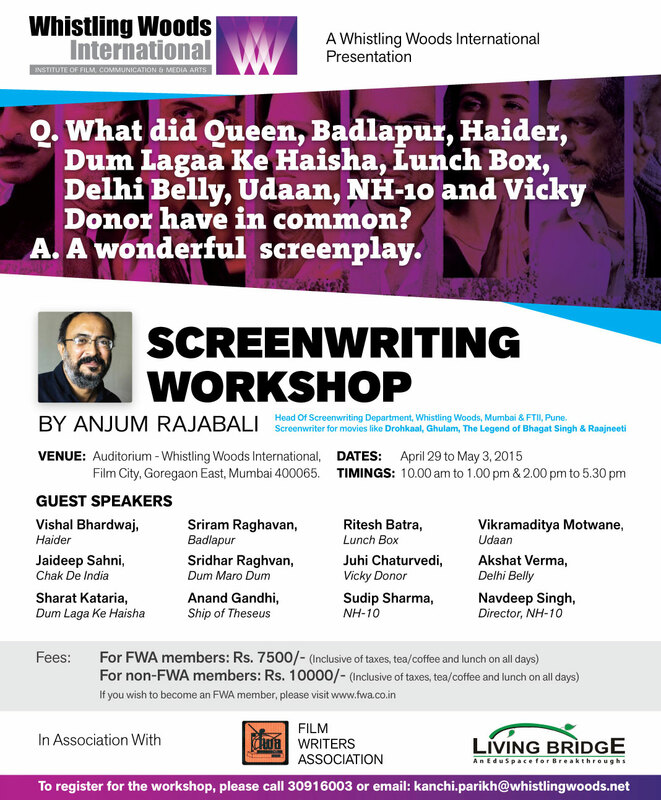 WORKSHOP : The last few years have marked the beginning of an exciting era for Indian screenwriters! More films are breaking the conventional mold, based on bold scripts. Badlapur, Udaan, Haider, Dum Lagaa Ke Haisha, Queen, The Lunch Box, Vicky Donor, Ship of Theseus, Delhi Belly, Chak de India, NH-10.. the list goes on. What’s more, the audience is welcoming these with pleasure. Gradually but steadily, the scriptwriter seems to be moving centre-stage! This workshop will not only cover all the basics of the screenwriting craft, encouraging you to develop competence as a screenwriter, but also expose you to how these stalwarts let their imagination fly with conviction. So, here’s your best chance to learn, via rich interactive sessions with writers who are redefining Indian screenwriting today! WORKSHOP INSTRUCTOR: Anjum Rajabali (Drohkaal, Ghulam, The Legend of Bhagat Singh, Raajneeti): Heads the screenwriting departments at Whistling Woods Mumbai and FTII Pune, and is an activist with FWA. Conducts screenwriting workshops, and script labs and fellowships for screenwriters.